Second volume of episodes from the Finnish-made children's animation based on the popular video game franchise. 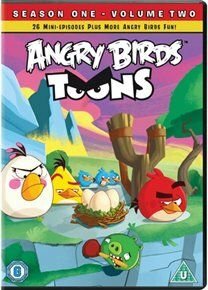 Like the game, the series follows the rivalry between the pigs of Piggy Island and the birds who flock there. Despite the continual attempts of the pigs to drive the feathered inhabitants of the island away, these birds are no mere victims. Red (voice of Antti Pääkkönen) and his friends Chuck (Pääkkönen), Bomb (Pasi Ruohönen), Matilda (Pääkkönen), the Blues (Lynne Guaglione and Heljä Heikkinen) and Terence (Heikkinen) are more than prepared to fight to protect their eggs. The episodes are: 'Green Pig Soup', 'Catch of the Day', 'Nighty Night Terence', 'Piggy Wig', 'Pig Plot Potion', 'Tooth Royal', 'Night of the Living Pork', 'King of the Castle', 'Love Is in the Air', 'Fired Up', 'Clash of Corns', 'A Pig's Best Friend', 'Slumber Mill', 'Jingle Yells', 'El Porkador! ', 'Hiccups', 'The Butterfly Effect', 'Hambo', 'Bird Flu! ', 'Piggies from the Deep', 'Oh Gnome! ', 'Shrub It In', 'The Truce', 'Operation Opera', 'Chucked Out' and 'Bomb's Awake'.